Was Lieutenant Columbo’s first name really Frank? But most readers will have doubtless seen freeze-frame close-ups of Columbo’s police ID, most notably in Season 1’s Dead Weight, that suggest his name is Frank. And while the name ‘Frank’ is certainly there for the world to see, the bigger question remains: is it canonical? In the opinion of show creators Richard Levinson and William Link, that’s an unequivocal ‘no’. The Lieutenant was never given a first name by them, nor did they ever wish him to have one. Columbo is Columbo, as simple as that. They even insisted that a first name given to Columbo in the script of a Season 1 episode be removed. The identity of this particular episode has never been revealed, nor has the name that was scripted, but if we assume that the episode in question was Dead Weight (which was the first episode of Season 1 that had Columbo interacting with fellow officers from the LAPD), then we could be on the path to an explanation. Perhaps an excitable fella from the props department had gotten wind of the first name revelation and had mocked up the police ID badge accordingly? Perhaps they plucked a name out of their head at random simply to fill a gap on the badge? We may never know, but the intention was certainly not for viewers to zoom in on the badge and identify that ‘Frank’ was scrawled there. VCRs weren’t mainstream for several years after Dead Weight came out, so no one was hitting pause to study the badge. Even though viewers and critics were interested to find out the elusive name, ‘Frank’ wasn’t on anybody’s lips. The name is similarly visible in 1975’s Matter of Honor (along with his badge number 416), but the displays of the ID were never too overt and the first name conundrum thankfully didn’t became a gimmick. Indeed it wasn’t until the 1980s that the issue of Columbo’s first name really became an issue at all. And that was because of a legal case in which the makers of board game Trivial Pursuit were sued by a fellow trivia kingpin Fred L. Worth – all over the christian name of Lieutenant Columbo. Keen to safeguard the integrity of his trivia encyclopedia books, Worth secreted within them false facts. If they subsequently appeared elsewhere, he could sue for copyright infringement. Or so he thought. The acid test came in 1984, when Worth found one of his false facts in the latest edition of Trivial Pursuit. And the supposed ‘fact’ was that Columbo’s first name was Philip. I’ve even played this version of the game myself years later, and was always mystified by that particular answer because, as far as I knew, Columbo didn’t have a first name. But Fred Worth wasn’t mystified – he was mad. He believed Trivial Pursuit had plagiarised more than 1500 of the facts that appeared in his trivia encyclopedias – but the one that proved it was Columbo’s first name because Worth simply made it up. In October 1984 he therefore filed a lawsuit against the creators and distributors of Trivial Pursuit demanding $300 million in compensation. The case never made it to court, though. Judges denied Worth’s claim and his appeal was also quashed. You see, Trivial Pursuit never denied using Worth’s encyclopedia as research. They used resources like that whenever they could to get as many questions as possible. So even though they evidently never found another source to verify what Columbo’s first name was (or wasn’t), they were in the clear. Allegedly Peugeot once claimed Lt Philip Columbo was their most famous driver. I DEMAND PROOF! As an aside, I have read that a Peugeot print advertisement (no date specified) claims that the most famous Peugeot driver was Lieutenant Philip Columbo. I have Googled extensively and can find no evidence of this ad. If anyone can verify this, please fire me a note in the comments below! It would be most interesting to see, although whether this supposedly came after the trivia clash of the titans or before is a complete mystery. We can eliminate Philip as a first name contender, which I think is a good thing. ‘Philip’ feels like a bad fit for Columbo. This leads us back to ‘Frank’ once again. It’s certainly a more plausible name, and it’s one that was much more openly attached to the Lieutenant in more recent years. For one thing, the name ‘Lieutenant Frank Columbo’ is written legibly enough on this evidence bag in Grand Deceptions from Columbo‘s comeback season in 1989. The show was more knowing in those days, so this could conceivably be an Easter Egg for fans, a meta-gag or an attempt at continuity from the earlier seasons. The strongest support for Frank Columbo comes from Universal itself. The packaging of its Seasons 1-4 DVD box set, released in the 2000s, featured artwork including Columbo’s police ID. ‘Frank Columbo’ is shown both as a signature and typed name on this packaging. I haven’t seen this with my own eyes, but I have no reason to disbelieve it. If it’s good enough for Universal, that should be good enough for us, right? Not necessarily. DVD artwork is just that. The name Frank was still never officially referenced by any other character in the show’s history – even at Columbo’s nephew’s wedding in No Time to Die. If ever there was going to be a first name given, it was going to be there in the company of his actual family. No, if we’re looking for official confirmation of Columbo’s first name that can only ever come from Levinson and Link. They, along with Peter Falk, have always stated that the Lieutenant’s first name was never identified – regardless of name badge close-ups and DVD artwork. So if we’re seeking absolute, canonical evidence, there’s none to be had. Will Frank suffice for most fans? Certainly. I even use it myself for my Facebook account as the little devils wouldn’t accept ‘Lieutenant’ as a first name (have they never watched the show?). But I’m just as happy being in the dark, because not knowing Columbo’s first name is as much a part of the show as never meeting his wife or never being sure whether his family anecdotes have any basis in reality. Where do you stand on the first name debate? Let me know in the comments section below, and thanks, as always, for reading! Tags: Dead Weight, Grand Deceptions, Matter of Honor, No Time to Die, Richard Levinson, William Link. Bookmark the permalink. He says Lieutenant not Denny! I remember Peter Falk when asked about “Philip” he remarked, “Yes that would be a name that Columbo is not proud of”. To add further weight, I don’t believe Fred Worth made it up and he had the only real source for that name and I have that book which stated that the name was used in a play about Columbo as well. In addition, why give away the name via a badge when you don;t want anyone to know? Philip as his name makes more sense than Frank at least to me. To add to your claim that Fred Worth made it up would mean that most of his trivia was made up and his goal was to compete with other books. Why is it that this particular piece of trivia is considered fabricated because he used that as his explanation to sue Trivial Pursuit owners. Philip is correct! I watched Murder By The Book last night and around 35:48 you can hear Jack Cassidy’s character say “Thank you, Frank” in response to Columbo. Check it out. I checked it out and I guess you heard Columbo saying “Thanks a lot, Mr Franklin”, not Mr Franklin saying “Thank you, Frank”. Columbo closes with “Thanks a lot, Mr Franklin. And listen, I am very sorry about what happened tonight”. Franklin then replies something that sounds like “Thank you, right.” but definitely not “Thank you, Frank”. I remember the TV tie in books released decades ago that had the warrant card on the front cover that clearly stated Frank. Um, Give your brother-in-law a message for me. I think it is. His first name was shown on his Police ID in the series, so I take Frank to be his real first name. I think he is like Inspector Morse and doesn’t like to use his first name much, so he just becomes known by his surname. Faye Dunanway asked Coumbo in “It’s All In The Game” what his first name was and he said Lieutenant. I know there are other episodes too where he avoids telling his first name. In a “Matter of Honor” Commandante Sanchez tells how he read of Columbo’s crime solving when referring to “Troubled Waters”. His first name must of been in the newspaper article that he read. So, their are several other references to Columbo being a famous Detective (Ruth Gordon also comes to mind). I could see for security reasons a Detective wanting to secretive about his first name, but Columbo seemed to famous to pull it off. I have been watching Columbo since I was a child back in the late ’60’s and I always understood he didn’t have a first name (the character) the same way his wife was just “Mrs. Columbo”. That’s the way it was intended and it doesn’t matter all the other stuff that was introduced later. It the creators, producers and even Mr. Falk stated there was no first name, there wasn’t. As you said, they made a prop ID and no one thought people would be able to freeze the frame and read it through. Let’s not spoil the mistery. Hi just my thought, Frank is good enough for me, But just when you mentioned his wife. I was watching the frank Sinatra roast on you tube & Colombo was a guest speaker & referred to his wife as rose to Sinatra for a autograph from him to his wife. All the little bits that come up ? Even if it’s not canon, I think Frank would be a good name for him. There was a champion bodybuilder at the time called Franco Columbu (see Pumping Iron). Maybe a subliminal link by someone in production…? Just like Prince, Sting, Cher, Twiggy, Shaft, etc…. I feel his first name is Frank, it goes with Columbo. I have always enjoyed the show and Peter Fall is one of my favorite actors. You wrote “No, if we’re looking for official confirmation of Columbo’s first name that can only ever come from Levinson and Link,” and I completely disagree. Levinson and Link’s opinion probably holds more water than many, but it isn’t absolute. Nor do they own the series. In any program, other writers, producers, and directors have the privilege of adding facts and background to the characters and their lives. We can perhaps chalk the badge in “Dead Weight” up to a genuine mistake, but since the series made at least two subsequent references to Frank, it’s canon. Put another way, I don’t believe that Levinson or Link ever wrote that Columbo had a policeman nephew. As much as everybody dislikes “No Time to Die,” you can’t discount the episode because it introduces a fact about Columbo’s family that L & L did not create. And even if there is some throwaway reference to Andy in a 1970s episode, my point still stands: television is, with few exceptions, a very collaborative medium where many, many people have a say in the development of the characters’ futures and their pasts. L & L don’t get the final say, any more than they could approve everything that ever happened to Joe Mannix or Jessica Fletcher. I like Frank . I have two cousins one Frank & other Philip who is a priest in West Lake in Cleveland . I like both names maybe one name for a middle & one for a first name . My feelings exactly. Columbo’s canonical first name is Frank. There are three references to it within the show. Case closed. So his name is Frank….right? gimmick may have started with an earlier tv series, “Man in a Suitcase” (1966-67) where the main character’s name was McGill who would never tell anybody his first name. This was a British series starring the American actor Richard Bradford. Don’t forget The Prisoner from the same era. The main character is known as Number Six. We never hear a name at all, though many believe it to be John Drake from Secret Agent/Danger Man. Another question is not really clear. Does Columbo speak Italian or not? In the few episodes where there is a mention about this point, some episodes let us believe that he did speak Italian (at least some Italian), while in some other episodes, the answer is clearly that he doesn’t. Anybody has an opinion or an answer? He actually speaks some Italian in a couple of episodes, notably Murder Under Glass from 1978. At other times he claims not to speak it. I know I’m really reaching here but he also speaks it fluently in “death hits the jackpot”, one of the”new” episodes. My opinion is that Columbo had no first name. A tiny mention in the first episode is not enough to conclude that it was Frank. In all the episodes, except for another quick appearance of Frank in an episode from 1975, his name is Columbo or Lieutenant Columbo. I gave up on “Columbo” adhering to any form of continuity logic when they had Wilson as “Freddie” in one episode and “John J.” in another. LOL I recently wrote about this in a blogathon about Classic TV Villains. My topic was the Meddling Monk from ‘Doctor Who’ and his pathetic attempts to rewrite History. While his ultimate goals were thwarted, I claimed he could still alter History in small ways. And I blamed one such adjustment as leading to Sgt Wilson’s parents giving him a new name in the revised Timeline. Haaa! That’s a more charming explanation than lazy script coordinators not researching a character’s history. Agreed! Amazing stuff. Alternately maybe he changed it to John J to give him some extra authoritaire! It’s similar to how Brody’s deputy in Jaws changed his name from Lenny to Jeff in Jaws 2. I thought when I recently went through all of the “modern” episodes there was a one verbal reference to Frank Columbo (not the label on the specimen bag), but I don’t remember now. Perhaps it was another written reference or a reference on the DVD box. I will have to pay closer attention the next time we go through the modern episodes. With respect to Mr. Levinson and Mr. Link, once they let their “baby” set sail on the video seas, it was kind of out of their hands. 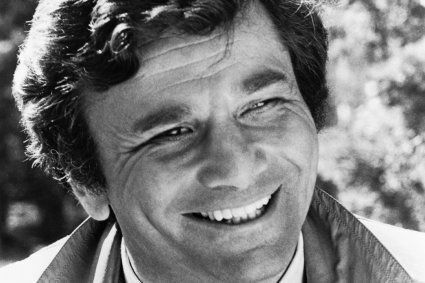 ‘Columbo’ grew on its own with input from others from the writers, the directors, the star, and yeah, even the prop man. The medium is a collaborative effort. They never originally envisioned him to look like Falk, but there you are – telly evolution. For me, if it shows up on screen, then it’s canon. If you’re going to deny what is actually there to be seen for your own preference, then you’re in fanfic territory. The intent of the creators, just as in their original vision of the character’ look, ended up at odds with what’s on screen. So it goes. If anything, it could still be that it’s not his real first name, just a nickname that he uses when forced to do so – like signing an official form like an ID badge. Columbo might have a hated first name and goes out of his way to avoid it, but uses “Frank” as a fall-back option when there’s no other choice. Just sayin’…. Lieutenant, Mrs., Dog. Why would he have a name. And even if he did, it would be Francis, Sinatra and all. Omitting Columbo’s first name was a part of his character in the same way Levinson and Link didn’t want him being seen working in a police office. They wanted him to just come and go, with a sort of mystery about him. His name on the show was Berthume. — http://emmytvlegends.org/interviews/people/william-link#: William Link insists that Columbo never had, and never will have, a first name (see Part 4, beginning at 25:00). — https://www.youtube.com/watch?v=yzKehvXNBus: where Peter Falk reveals Mrs. Columbo’s first name. Great resources, thanks Richard. The Rap Sheet interview is a beauty! I’ve never stumbled across that site before. I am from Germany, I know the German dubbing versions by heart, and I can put both my hands into the fire: Never ever it was Frank Columbo in a german dubbing version in any of the 69 cases. For too long I was searching for the first name until I finally read one day that the first name was written on the badge in several cases. I would have heard it if Columbo was ever to be called Frank. Only the gym cleaning guy in “An Exercise in Fatality” succinctly called Columbo “Hey Charlie”. Since Columbo is a citizen like you and me, he has to have a first name, so I don’t agree on that he has no first name at all. But because Columbo is an Italian, the name Franco would fit better. Frank reminds me too much of Lt. Frank Drebin alias Leslie Nielsen. Oh, how I wish Leslie Nielsen would have played a Columbo villain at least once in his two appearances! Thank you very much for that intel! Columbo’s global audience is a great thing for information exchanges! Well done! Love having all of this information, I was not aware of Levinson and Link’s opinion on the matter. In my mind, this is no longer an Identity Crisis. I’m with you, I don’t give a hoot.